I see trees some small, some tall. They’re all green, bright green. The trees are the same color as the grass. On the porch where I am sitting, there is a tub full of water, inside the tub full of water there is some Coke, and beer. There was a party here before we arrived. There are three chairs and two outdoor couches. I feel the fabric of the couch on my legs. I don’t feel every individual stitch though. It feels sort of scratchy, but not scratchy enough to be irritating. There’s also a round table on the porch with five dining room chairs. On the table there’s an oil lamp, a basket of bread, and a pepper grinder. We ate at this table last night and it made me feel relaxed. Behind me there are some small, purple flowers in a planter box. I can’t smell the flowers because my nose is clogged. It seems like my nose is always clogged. Across the lawn Bennett and Aunt Elsie are talking to each other about who knows what. On one tree I see five birdhouses are hanging. Two birdhouses are pink, one is yellow, and another one is blue. The last one’s white, but they are all empty. At the bottom of the yard, there is a line of evergreen trees and then a lot of cars. The cars are there because of the swimming pool that’s just out of my sight. Occasionally some kids with pool toys and swimming suits walk by in the far away parking lot. I hear lots of kids from the pool. There’s shouting and yelling. It sort of makes me feel like I want to be with them. I also feel very hot because the temperature is at 80 degrees. I think they’re playing a baseball game down there because I hear a bat hitting something and I hear “get it, get it” and “I got it” and “throw it to me.” I feel tired because last night I was up until 10:00 and I got up at 7:00. I got up at 7:00 because I wanted to read on my Kindle. It really is a great and comfortable place to be out here on Aunt Elsie’s and Uncle Al’s back porch in Washington, Pennsylvania. 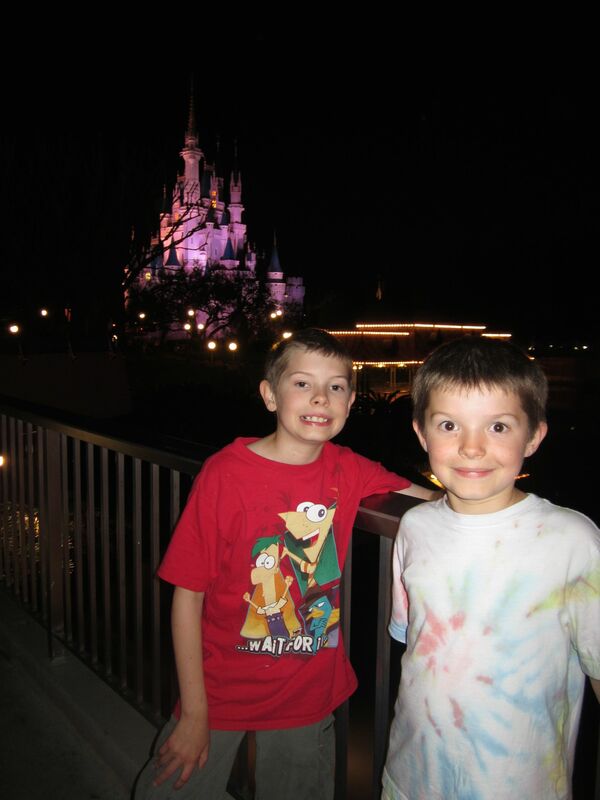 This blog is not about what we did at Disney World. It is some facts and secrets about Disney World. Did you know that only 2 countries flags are permanently on display in the parks: the American and Swiss flag. The Swiss flag is hanging over the Swiss Family Tree House. I think that’s a great honor. Be careful around a large golden camel next to the Magic Carpets of Aladdin ride, it spits. I think with that one Disney has gone too far. On Tom Sawyer Island, it is rumored that the creaks and groans of the mill wheel actually play “Down by the Old Millstream.” They don’t, but it would be pretty funny if they did. Bennett and I ran around on the island for a long time on the day we went just with mom. We really liked the fort there since they had shot guns that made shotgun sounds. There was a rickety bridge made out of barrels that was fund to run across. Did you know that Big Thunder Mountain is 197 feet high – the tallest any building or object can be in Disney is 200 feet? Now that’s high. Space Mountain is 183 feet. In it’s a small world there are 289 miniature figures all singing the same song and you have to listen to it for 5 minutes. The 289 miniature figures have 2296 specific garment pieces. When we were waiting in the line, the ride got stuck. We thought the people coming off the ride after it got started looked a little shaken – can you imagine getting stuck with all the some miniature figures doing the song over and over and over again? Did you know that Test Track has nearly one mile of track and goes nearly 65 miles per hour. It’s the longest and fastest ride at Disney World. Maybe that’s why we rode it 3 times! In Mission Space, take a look at Mars It has color shifting paint that costs $800 per gallon. I think that that is exactly what Disney does. They buy expensive stuff and get more money then they spent. Stop for a moment in front of Mexico pyramid. It looks tall, but it is only 36 feet. Stop at the outpost between China and Germany and lift the lids on the old fashion Coca Cola coolers. I didn’t know about this when we went or otherwise I would have done it. If someone knows, please let me know. There was a problem when they made ‘Soaring’ because flying above national parks is not allowed. It took months to get permission to fly over and film it but it was worth the time, well at least I think so. Those rock climbers at Yosemite had to stay suspended there for 6 hours. I don’t think I could take it. Did you know that the Eiffel tower in the France country section was made using Gustavo Eiffel’s actual blueprints? I thought that one was cool. In Africa next to the Tusker House listen closely and you will here a landlady banging on a door shouting. That one was funny. For Kilimanjaro Safaris come early in the day the animals are most active then. I planned our itinerary for Animal Kingdom and we did this. It really worked, we saw lots of animals and the line was really short. We even had to stop the tour bus because some giraffes were standing in the road. On Expedition Everest, look down at the track when the yeti is tearing up the track. If you look down you will actually see the track flip over. It’s really cool we saw that one. The ride is awesome. Just to show you how awesome, I went 8 times. All right that wasn’t to show you but its still. AWESOME! Here are some facts for the Animal Kingdom. There are 1,500 animals in the Animal Kingdom these 1,500 animals require 4 tons of food each day. Now that’s a lot of food! On the Tree of Life there are 103,000 different leaves each placed to sway in the wind. In Muppet Vision 3-D as you go in LOOK UP at the clock, specifically the minute hand. No, he is not going to fall. He is tightly secured on it. It’s doing its job and I laughed. To get the feel of the Twilight Zone for Tower of Terror, Disney imagineers watched all 156 episodes more then once. The elevator cars on the Tower of Terror ride is pulled down faster then the speed of gravity. You know that because you are pulled up agaist the strap. Mom screamed. Being in the parks is just so tiring (well at least for mom) but it’s tiring for me too when we are there from 9:00AM until 10:00 and don’t get back to bed until 11:00pm. It’s a ton of fun though so it makes it all worth it. It’s also big so you have to be a fast walker, but you can rest your feet in the lines, so that’s not so bad. The lines are usually big so Fast Pass work well, but also you have to stop for a moment and just rest. You should try to go. It’s fun. I see tall trees. They’re green trees too. Wonderful green! (I have not seen green for a while.) I see the small camp host sign and the camp host RV. The RV is probably bigger than ours. I know there is a dog in there somewhere I saw him earlier. The dog is very shaggy. I see a big bird flutter across the road (maybe a owl?) (I thought those were asleep during the day? )(I later learned it was a falcon.) I see the camp host golf cart next to the camp host sign. Compared to the camp host RV the golf cart is quite small, but compared to the camp host sign it is quite big. I see a school bus drive in to the campground. I did not know they did field trips out here. Driving behind it there is a camper. It turns on a different road then the school bus. Now an RV is driving down the road, suddenly it stops, a guy gets out, walks around the RV, gets back in the RV, and drives away. I wonder what that is about. There is a dumpster on the corner for garbage and it’s blue. In front of us there are 2 sites, they are both about the same size. One is for a camper and one is for a camp host. By the site for a camper there is an electrical outlet with the number 1 on it. The road surface and the site are both white because of the material they are made of. I smell water and shampoo because Dad is taking a shower. I feel relaxed because I am happy that I got this done with. I feel safe because I am inside the RV. Mom and Dad are up front. I don’t feel that comfortable because I don’t like writing in my journal like this. 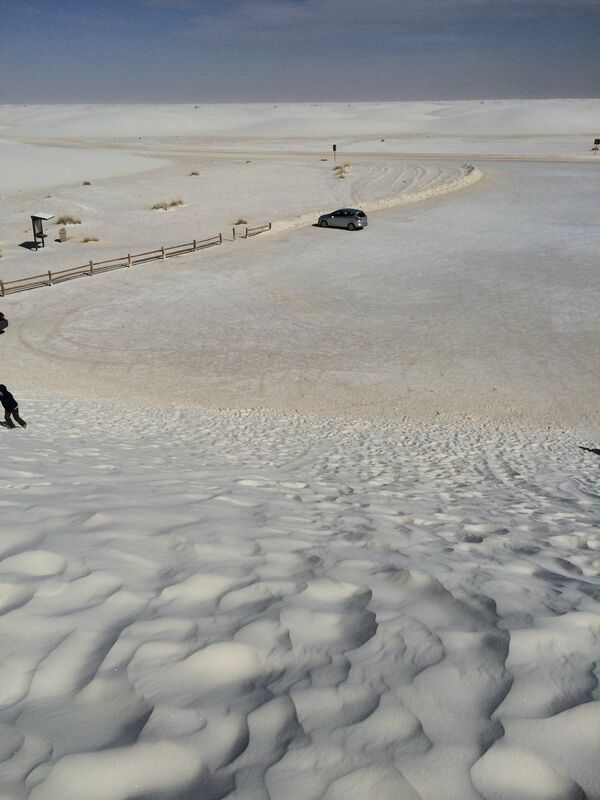 White Sands, the world’s largest gypsum dune field, is in New Mexico. Did you know that sand dunes can move up to 25 feet a year? The sand dune does that by having more and more sand blow over the top of a dune. 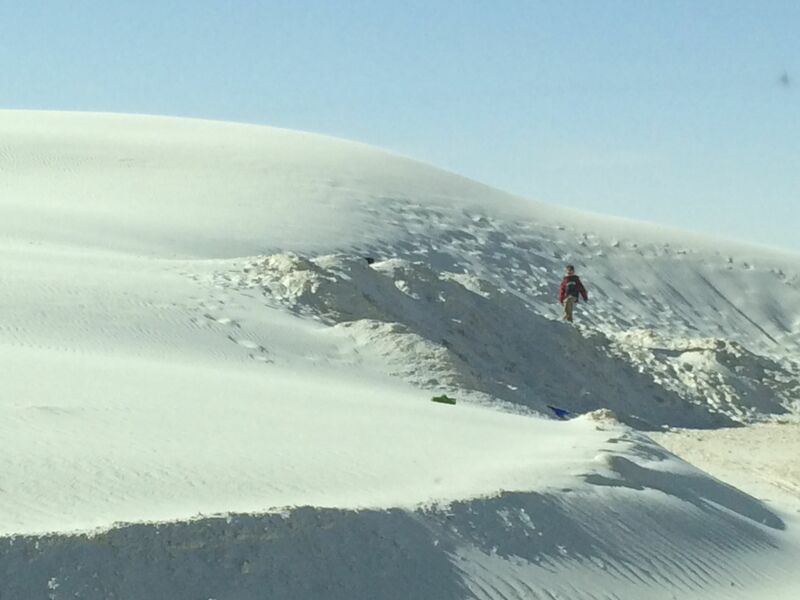 When we visited White Sands we rented a sled and slid down the steep part of the dunes. It was very hard to climb to the top of the dune because it was so steep. I collapsed nearly every time into the sand dune as I climbed up to the top. We went to the place where a lake would be during the rainy months. When the lake dries up during the nonrainy season the gypsum is then selenite, which breaks down from the wind and gets smaller and smaller until it is sand. The water from the mountains around White Sands is gypsum rich because there is gypsum in the mountains. Walking on the dry bottom of the lake reminded me of walking on Oreo cookies. When you walked on it, it was the sound of crushing Oreo cookies. The white of the selenite was very white. We had a great time at White Sands National Monument. If you go, I recommend renting the ten dollar sleds. Check the weather because it was cold the day we went, but it gets really hot there. It’s in a desert you know! The Grand Canyon is huge. It is 1 mile deep. It is a valley and inside the valley it looks like there is another valley. That second valley is the exact spot of the Colorado River. In one place we can barely see the river but you can hear the water rushing. It was sort of cold but not too cold. I had to wear a big sweatshirt. We walked down to Ooh Aah Point. 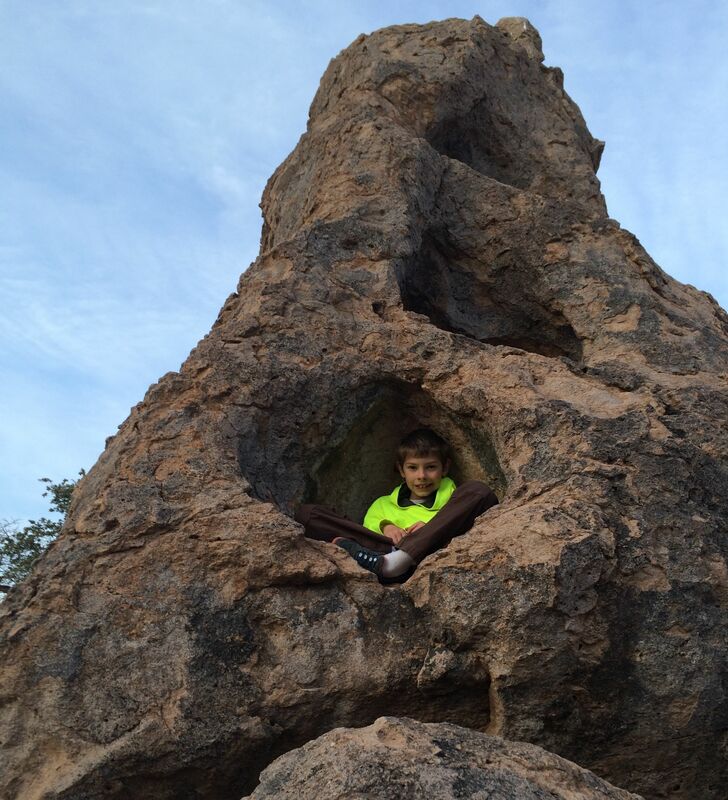 It’s a place on a trail to the bottom of the canyon. It’s the first stop out of 3 or 4 stops. It’s a panorama view. The reason we went on that trail is because all the other trails had snow on them the day we were there. Overall it was not a bad day. Wait, did I say not a bad day? I meant it was an AwEsOmE day. Wait, did I say AwEsOmE day? I meant it was a MARVELOUS day. Mules take luggage and supplies down to the ‘hotel’ at the bottom of the canyon. Yesterday we went to the San Andreas Fault on an eco-tour by Desert Adventures. We saw the stars. We got to see the Altair Star (for those of you reading that are from the Altair School). It was a part of the Summer Triangle. We got to see a replica of an Indian village. There we saw an actual Indian arrowhead. We went in a Jeep. Jeeps were built for World War II. This Jeep was built in 1980s there were only 28,000 made. It was a CJ-8 – C was for civilian, J for Jeep. There are two different geologic plates at the San Andreas Fault. There is the North American Plate and the Pacific Plate. The North American Plate goes all the way to Iceland and the Pacific Plate goes all the way to Japan. They meet here at the San Andreas Fault, which is pretty cool. There are about 150-200 earthquakes a day. You only feel about 4 a year though. The tour was cool. Mema gave us this tour for Christmas. Thanks Mema! We also saw a plant called “Earth’s Potato Chip Plant.” It was very salty when you licked it. In the picture there is a Teddy Bear Cholla Cactus. This is not what it seems. If you get this poky into you in the next hour it will go in one more inch looking for water. When you try to get it out it will release many bores and you will need pliers to get each one out. Editor Note – any pictures appearing under Carter and Bennett writing were TAKEN by Carter or Bennett.